Photos by Josh Silberg (top), Christian Kelly (right), and Maria Shallard (left). 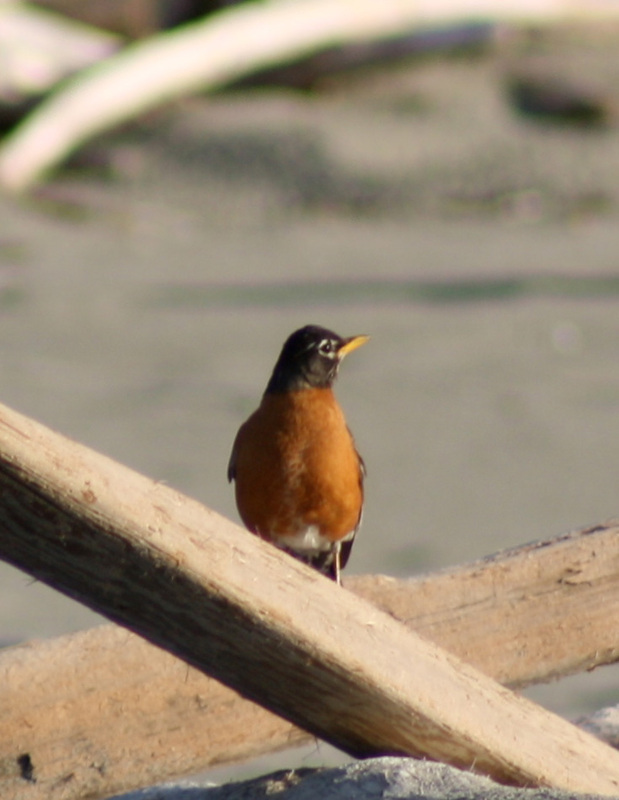 The American robin is one of the most easily identified birds across North America. Its bright orange-red belly and yellow bill makes it easy to spot from afar, and its merry dawn song is familiar to most people. Further identifying features include white markings around its eyes, under the bill, and under the tail. Its tail is usually dark grey-black with white streaking around the outsides of the feathers. Males and females are similar, and juveniles have brown mottling on their cinnamon-orange bellies. 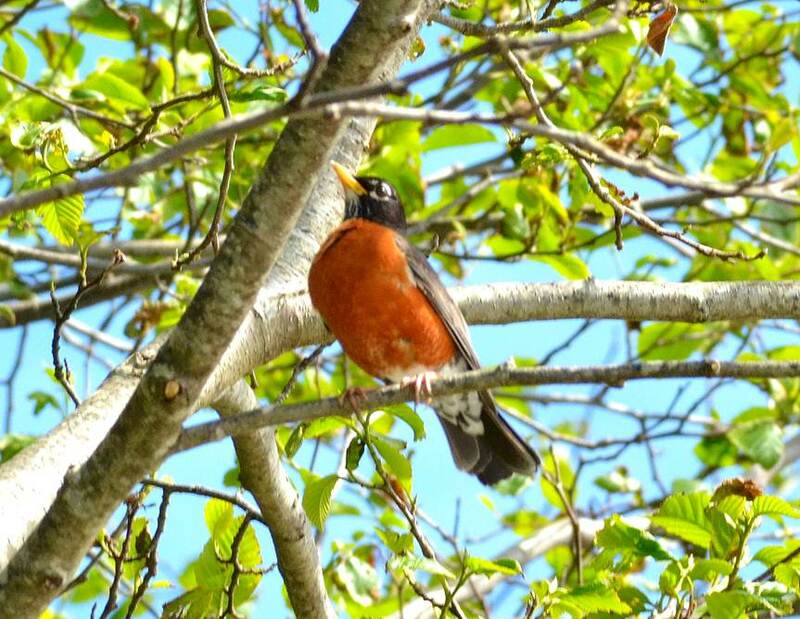 The American robin is found in a variety of habitats, including urban lawns and parks, especially after a heavy rain when earthworms litter the ground. It can also be found in forests, woodlands, and wetlands. It is regarded as the herald of spring throughout most of Canada. It winters throughout most of the United States and some parts of Central America and southern Canada. 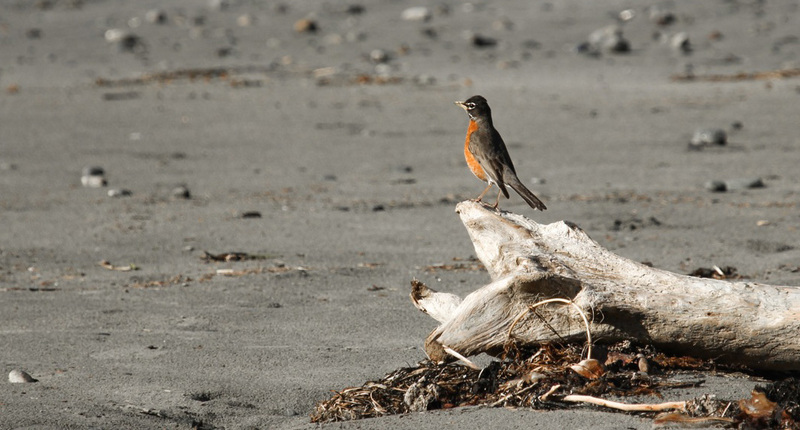 Some birds remain in the US, but many migrate north for the summer months. It is present year-round on the Central Coast of BC. The varied thrush has similar colour to that of the robin, especially females. It is more orange all over, however, not just on its belly. It lacks white markings around its eyes and throat, and a black band runs from its bill to the back of its head. The male varied thrush has a distinct dark band on its chest, and both sexes have orange and black banding in their wings. Robins' eggs are a brilliant light blue, which has become part of North American culture in many ways. 'Robin egg blue' is a commonly sought-after colour in everything from crayons to paint. One shade of robin egg blue is known as 'Tiffany Blue,' and is a specific, trademarked colour used by the jewellery company, Tiffany & Co.
Robins live year-round in most of the US, but are still often regarded as spring and summer birds. This is because they generally move to wooded regions with berry-producing shrubs for the winter, vacating the lawns and parks where they are commonly seen in the warmer months. Dunn, J. L. and Alderfer, J. (Eds.). (2006). National Geographic Field Guide to the Birds of North America. (5th Ed.). Washington, D.C.: National Geographic Society. Pp. 360-361. American Robin (Turdus migratorius). The Birds of North America Online (A. Poole, Ed.). Ithaca: Cornell Lab of Ornithology; Retrieved from the Birds of North America Online. Accessed 19/02/2013.